New low cost pricing released on available inventory of the highly sought after Specter IR Thermal Rifle Scopes now available from SPI CORP for general civilian applications. SPI Corp is a leading provider and manufacturer of thermal scopes and thermal imaging systems to Law Enforcement and Military professionals. They have resources dedicated to manufacture of new units as well as refurbishment and repair of existing fielded systems. They place a special emphasis on providing low cost thermal scope solutions to agencies and individuals nationwide. Thermal riflescopes are electro optical systems designed to be mounted on a rifle for aiming at targets in any conditions. 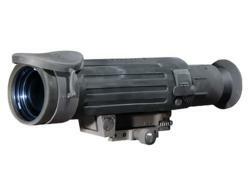 Similar to a common rifle optic the thermal scope offers the user the advantage of seeing in the dark so that they can fire the weapon at any time. Originally designed to give US Military forces a tactical advantage on the battlefield, the thermal weapon sights have now found there way into law enforcement and civilian applications. Originally billed as “the first affordable thermal weapon sight”, the famous Elcan / Raytheon Specter IR thermal scope was the first scope to bridge the gap between military and non-military applications. “This is by far the most popular scope with hunters and sportsmen,” explains Jim Santana, Sales Manager SPI CORP. “ I have people waiting in line for the Specters.” SPI repair facilities refurbish the scopes to factory image quality and test them before they are shipped to customers. Customers are encouraged to contact SPI Corp to check the latest stock and reserve their unit. As of this release they have stock of the SPECTER-IR thermal scope. Raytheon ELCAN Optical Technologies is a fully integrated, global provider of precision optics for Medical, Defense & Security, Industrial, Commercial and Entertainment customers. With a legacy spanning more than 160 years in the design and fabrication of high precision optics, Raytheon ELCAN Optical Technologies' founding companies include Ernst Leitz (Germany) and Hughes Aircraft (U.S.A.). Raytheon ELCAN is an acronym for Ernst Leitz CANada. The name is synonymous with quality, innovation and performance. Optics by Raytheon ELCAN are found in the most demanding, high-precision optical systems in the world. Today, Raytheon ELCAN is part of the Raytheon group of companies with over 325,000 square feet of manufacturing space in Midland Ontario. SPI Corp has been in the business of manufacturing and distributing thermal imaging solutions for well over a decade. Existing products include the M5 pan tilt systems and the M1-D thermal PTZ as well as thermal scopes and infrared cameras. Potential customers interested in learning more about the ELCAN Specter IR Thermal Scope or for purchasing options including the entire line of low cost thermal scope solutions offered by SPI Corp can visit http://www.x20.org. Customers seeking immediate attention regarding these products should contact Jim Santana at 702-369-3966.